This September, the University of Reading hosted a workshop, which showcased postgraduate research on the theme of interaction in imperial Greek literature. 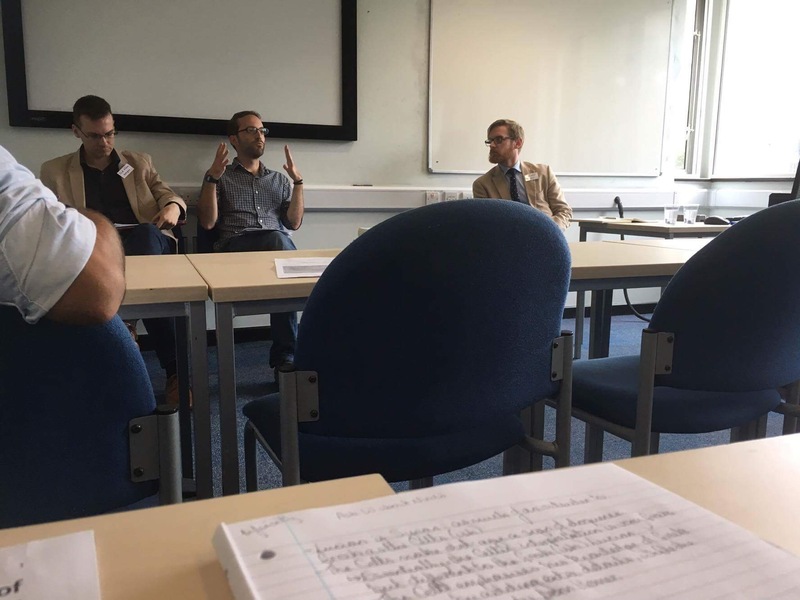 The workshop resulted from informal discussions at the Annual Meeting of Postgraduates in Ancient Literature (AMPAL) 2015, where over two intensive days of presentations, only a single panel of three speakers was dedicated to imperial Greek literature. Identifying a desire to bring those working in this field together, Claire Jackson (Cambridge) and I came up with the idea for a one-day workshop. One advantage of this was that we were able to include researchers working on many different authors and texts in a single programme. While many of us regularly meet others working on our own author/s, we are usually less aware of postgraduates who work on other imperial texts. It was great to meet others who do so, hear their contributions, and make connections between authors, texts, and wider themes. Interest in the workshop was widespread, and the good turnout of Reading students, both undergraduates and postgraduates, was particularly heartening. Over three sessions, we were treated to papers on Plutarch, Lucian, Aelius Aristides, the novels, pseudo-Appian, and a wide variety of other literary sources, like papyri and inscriptions. The first session ex plored intertextuality in two imperial Greek authors. Chrysanthos Chrysanthou’s (Heidelberg) paper suggested a possible allusion, hitherto unnoticed, in the prologue of Plutarch’s Demosthenes to Plato’s Theaetetus. This allusion to Plato’s dialogue, in which the life of the philosopher is juxtaposed with the life of the orator, is well placed at the very beginning of these Plutarchan Lives, since they deal precisely with men who oscillate between philosophy and oratory. The reference may guide readers, actively encouraging them to consider the philosophical value of studying rhetoric. Another author very well-acquainted with rhetoric and its implications, Aelius Aristides, was the subject of the next paper. Francesca Modini (King’s College London) examined his oration To the Rhodians. In it, the author/speaker compares himself in his mission of persuading the Rhodians to restore civil concord to the archaic lyric poet Terpander, who famously resolved a civil war in Sparta with his music. Francesca demonstrated, however, that the allusions go beyond the surface level of explicit references like this. She pointed out that it is a whole series of often subtle allusions to earlier authors (of both poetry and prose) and mythical or historical events that enrich the reader’s experience. In the second session, two Nicks (Nick Wilshere and Nicolò d’Alconzo) shed light on different aspects of works by Lucian. 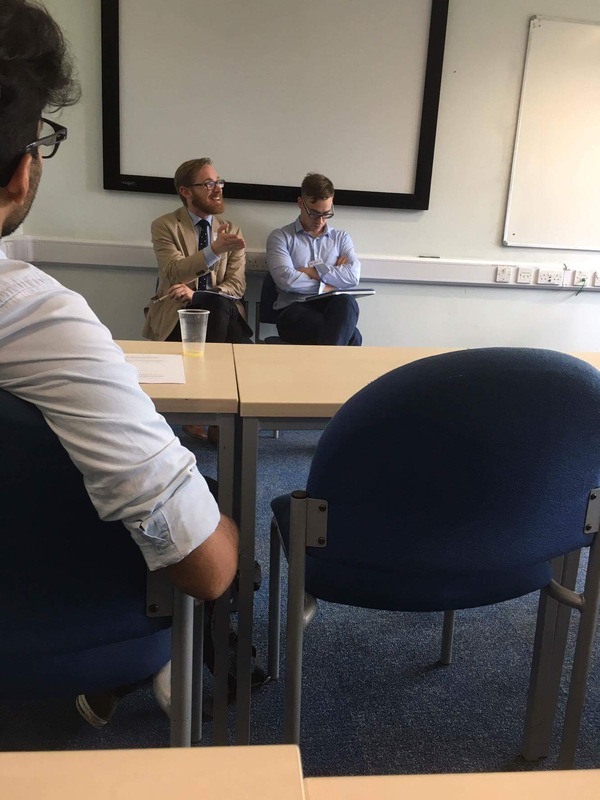 Nick Wilshere (Nottingham)gave a close reading of Lucian’s short piece, Hercules, in which the Greek narrator, travelling in Celtic lands, encounters a painting of Herakles or ‘Ogmios’, which he has difficulty interpreting. A local Celtic ‘philosopher’ comes to his assistance, and the two men compete to display their cultural education (paideia) by quoting Homer. Nick analysed the delicate interplay between the two; how each character uses the particular lines he quotes, embedding them in a new context. Nicolò (Exeter) journeyed from Lucian to the Greek novels, pointing out that various features of Lucian’s dialogue, the Amores, have counterparts in the novels. For example, both the Amores and Xenophon of Ephesus include similar voyages from east to west. Other elements common to each include the appearance of temple attendants as characters, settings in ‘Platonic’ gardens (like in the Phaedrus), and the device of describing or interpreting art. The two papers of the final session each dealt in different ways with the literary tradition, its reception, and those who utilised it for their own ends. Chris Mallan (Oxford) dealt with Pseudo-Appian’s Parthica, a text previously neglected by scholars, dismissed as a product of the Byzantine period. Yet references to a projected Parthica in Appian’s own work, and similarities between this text and Plutarch’s Antony suggest, Chris argued, that the author of the Parthica was more probably familiar with Appian’s work, and wrote in the second century A.D. This author may have appropriated Appian’s name for legitimacy, which raises questions regarding literary imitation and imposture at the time. Dan Jolowicz’s (Cambridge) paper challenged the widespread assumption that Greeks in the imperial period were not interested in reading – or enjoying – Latin literature. He drew attention to some Greek inscriptions that seem to refer to Greek poets composing in Latin, papyri with texts (like Virgil) designed for Greeks wishing to learn Latin, and references in the literature to Greeks reading Latin works. Our own colleague Ian Rutherford gave the very entertaining keynote address, which examined interaction between Greece and Egypt. In particular, he focussed on a passage from Philostratus’ Life of Apollonius of Tyana, in which Apollonius and some followers visit the cataracts at the source of the Nile. Noting that it is impossible not only to take but even to imagine the road to the source itself, Philostratus evokes a poem by Pindar on the subject of the divinity who guards the Nile. Ian’s talk prompted much discussion on Philostratus’ account of the visit to Egypt, the reference to Pindar, and Greek perceptions of Egypt and Ethiopia. Following the keynote address, a group discussion brought together some of the themes that emerged throughout the day. Topics that arose included the status of earlier literature in the imperial period and the effect of imperial allusions to it (i.e. Which earlier Greek texts were widely read? How familiar would an audience be with works referenced implicitly or explicitly in imperial texts? ), the long-standing relationship between philosophy and rhetoric, and levels of difficulty and/or nuance in texts (which could potentially separate educated from uneducated or Greek from non-Greek). Questions relating to performance and identity, and the expression of shared identity were also explored. Personally, one of the most enjoyable aspects of the workshop was being able to engage with so many different texts, many of which I had encountered only cursorily or not at all. The range of authors, works, and genres represented at the workshop demonstrates just how rich the field of imperial Greek literature is. It is clear that there is still much to consider in this very fruitful area. I hope that future events like this will continue to provide opportunities to disseminate such invaluable research. 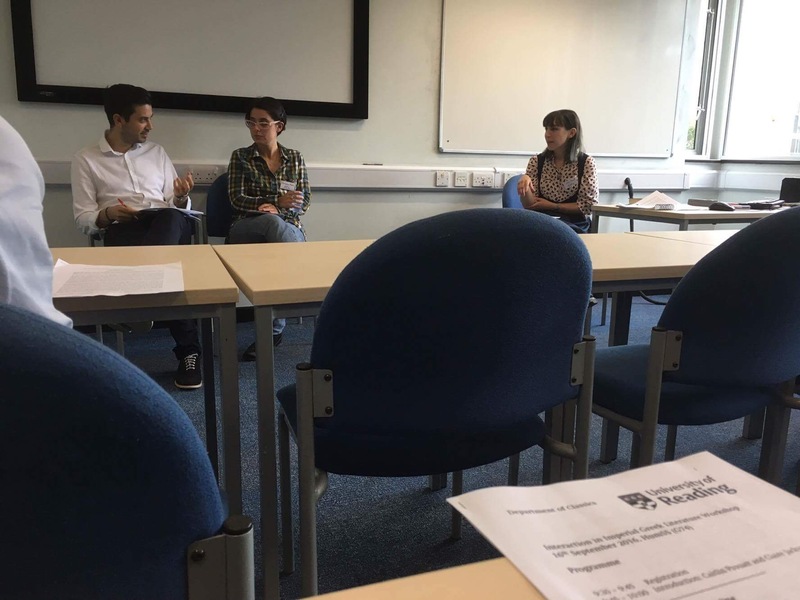 The organisers gratefully acknowledge the generosity and support of the Graduate School and the Classics department at the University of Reading, the Jowett Copyright Trust, and the Society for the Promotion of Hellenic Studies, without which this workshop would not have been possible. In order to reach other researchers working in imperial Greek literature, share ideas, and advertise upcoming events, participants decided that a network should be created. This network, SIGIL (Studies in Greek Imperial Literature) is aimed at postgraduates and early-career researchers, but anyone interested in the field is most welcome to join. Photos courtesy of Joe Watson.